Lord Colin MacHugh is unimpressed with the life that his newly acquired title and position as brother and heir to a duke allows him to lead. He misses his life in Scotland, and he is frankly bored with the endless cycle of drinking, wenching, and ribald humor that consumes most of the time of his peers. An unexpected meeting with Miss Anwen Windham at the Home for Wayward Urchins leads to the discovery that she is much more than the demure, acquiescent young lady she has appeared to be in the bosom of her family, his brother’s new in-laws. In fact, Anwen may be as fiery as her hair, and Colin finds her anything but boring. Anwen survived a critical childhood illness, and her family’s lingering concern about her health is smothering her. She feels as if she has lost the strong-willed child that she was before her illness. A veteran of several London seasons, she is also weary of “the waltzing, the fortune hunters, the at homes, the fittings.” Her position on the ladies committee for the Home for Wayward Urchins has led to an interest in the orphans that is greater than the typical young lady’s charitable cause. When Anwen learns that the home has only enough funds to operate for another month or so, she is determined to do something about it. To her surprise, when she questions Colin, who owns a successful distillery, about financial matters, he treats her questions seriously and treats her as an intelligent being. That is the start of genuine friendship. As Anwen and Colin work together to save the orphanage and too-knowing, irrepressible urchins who steal their hearts and earn their loyalty, friendship deepens and they fall in love. But there are those who are working against their plan to save the home and who are determined to discredit Colin. When the money raised at a charity card party hosted by Anwen’s Aunt Esther, the Duchess of Moreland, goes missing, Colin is accused of stealing it. Colin’s reputation and his future are at risk. It will take Colin’s considerable intelligence, Anwen’s unwavering allegiance, and the help of some special urchins for Colin to clear his name and claim his Windham bride. 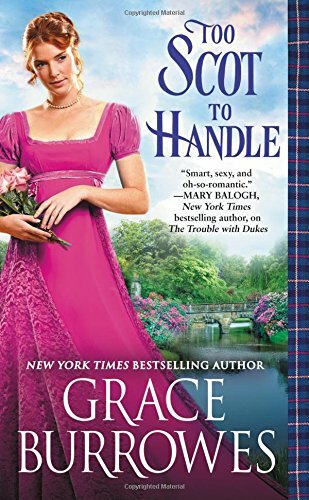 Too Scot to Handle is the second of Burrowes’s Windham Bride books. Anwen is the sister of Megan, heroine of The Trouble with Dukes, the first book in the series, and Colin is the brother of Hamish, Duke of Murdoch, the hero of that book. There are some similarities between the two stories, but Anwen and Colin are very much their own persons. And likable, sympathetic persons they are. Theirs is a quiet love story that develops sweetly and persuasively with almost no internal conflict. I thought it was wonderful but I am not a reader who is unhappy without high drama. Readers who are may find this story slow. Note: The original Windham series consists of eight novels, four novellas, and two short stories. The Windhams also turn up in minor roles in many other Burrowes historicals. There are two more sisters in Tony Windham’s branch of the family. Their books No Other Duke Will Do (November 7) and A Rogue of Her Own (TBA) are next. Hamish and Colin MacHugh have five other siblings, and Burrowes has suggested that she might write some second-generation tales for Windham offspring. Then, there are the daughters of Percival and Tony’s deceased older brother Peter. All these characters hold the delicious promise of another twenty or so books in the world we Windham addicts love. Thank you for the great review. I read The Trouble with Dukes, and I've been looking forward to reading Colin and Anwen's story. She is my favorite historical author and I've never been disappointed in any of her many stories. I always look forward to the next one - thanks! Thanks for the review.....one more time you have made me feel deprived because I do not have nor have I read this book yet. Y'all are killing me. But, in the most charming manner. Thanks, Janga! I had chance to chat with Grace Burrowes at RWA last week but wasn't able to get any of her books. They flew off the table! I hope you all read and enjoy the book. Annette, I'm glad you find us charming at least. :) Since PJ and the other Dish reviewers frequently add to my TBR mountain, I sympathize with your plight. I've read other wonderful reviews on this book and look forward to reading it. This sounds like it will be a delightful read. I enjoy extended family series.